For a spacious suite in a great location, stay at Emerald Suites Cameron, a sparkling gem in Las Vegas. Emerald Suites has introduced an exciting new concept in corporate and leisure accommodations to Las Vegas. Our spacious suites are tastefully appointed and designed for your complete comfort. The suites include a living area featuring high-speed Internet access, satellite television with premium channels and a separate bedroom for your comfort and privacy.Each suite is equipped with a whirlpool kitchen that includes a frost-free refrigerator, dishwasher, microwave, oven and stove. Looking for a quiet getaway? Relocating to Las Vegas?Are you in town on a special project?Take a refreshing swim in the outdoor heated pool or relax in the whirlpool spa. 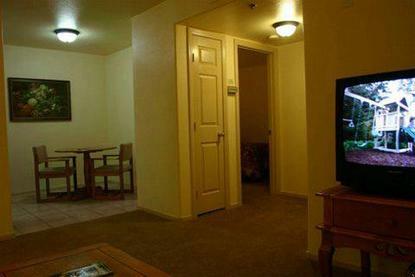 For your convenience, the hotel offers on-site laundry facilities and a 24-hour front desk. Emerald offers something for everyones budgets and desires. Emerald Suites Cameron features lush landscaping and comfortable one and two bedroom accommodations, each featuring a full kitchen, a private patio or balcony and free high-speed Internet access.